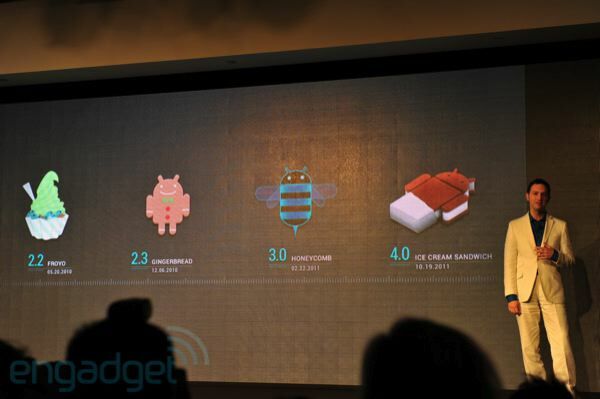 Google has taken the stage in Hong Kong to make the next version of Android OS, nicknamed Ice Cream Sandwich, a thing of reality. Better known as Android 4.0, the update offers a massive redesign to the user interface and adds a plethora of new features. Some of the highlights include an NFC-enabled feature called Android Beam, offline search in Gmail, new lock screen features and a fancy unlocking method called "Face Unlock," which uses facial recognition to ensure strangers can't use your phone without permission. Ice Cream Sandwich also includes enhancements in almost every native app within Android itself. The SDK is already available for Android 4.0, and the update itself will make its first public appearance on the Samsung Galaxy Nexus, also unveiled tonight. After the break, we'll cover all of the nitty gritty details, along with some excellent screenshots below. So come along, why won't you? Android Beam, a NFC feature that lets you exchange websites, contact info, directions, YouTube, etc. Don't like some of those preloaded carrier apps? Disable 'em. Android Engineer Dan Morrill mentions that, among other new features, any app can be disabled, and while it will still take up space in ROM, it won't be snatching any of your precious resources or clock cycles again if you don't want it to.